Treating head and neck pain at a new level. As dentists we are quite familiar with having to deal with pain. Often times, God willing, we are pretty good at it. However, I have to tell you that there are times when what we know and what we have been taught simply isn’t enough. Then we find ourselves using old fashioned remedies and failing treat our patients well. We have a professional title, doctor, which comes from the Latin and means teacher. Literally we are charged to be teachers, and to inform our patients about their clinical choices so that they can make an informed decision to acquiesce and accept treatment alternatives. Daily I try to remember that, but let's get back to facial and head and neck pain. There are occasions when dentists and physicians, I express it that way because I am tired of the distinction between dentists and doctors which are one and the same, are unable to diagnose the cause of pain, because we are not trained to identify the symptoms correctly. Tragically we discover our errors after a line of root treated teeth have failed to stop the pain. Fortunately, there are teams of specialists now who can treat the most obscure pains and get relief of symptoms using astonishing new diagnostic tools and treatment modalities which were simply not available until relatively recently. 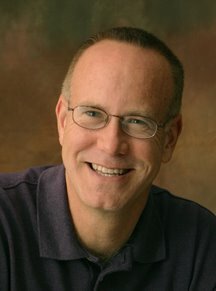 I recently heard Steven Graff-Radford, D.D.S. 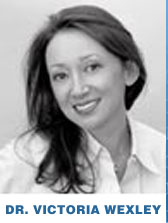 , Co-Director of The Pain Center at Cedars-Sinai, speaking at the Beverly Hills Academy of Dentistry. Frankly I was blown away and it wasn’t because of his South African accent. 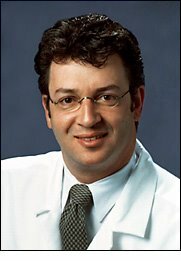 He and his team have ways of diagnosing migraine and Tic dolaru and a host of other very nasty conditions including brain and head cancer, and can break it down and find specific treatments that really work. 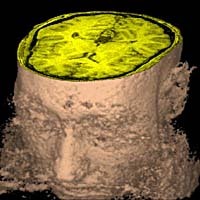 For example, it has been discovered by using M.R,I, (Magnetic Resonance Imaging) and CAT scans (Computed Axial Tomography) that certain patients who complain of blinding pain have an enlarged blood vessel that lies adjacent to a nerve bundle where it exits the base of the skull. In such cases a delicate procedure to displace the blood vessel completely solves the problem. This was never known or even possible before. Needless to say I am really glad to have professional colleagues like Steven and Dr. Victoria Wexley to whom I can refer. So the point is this. If you, or some one you know has pain in the head or neck give a call, we may be better able to help solve the problem now than we ever were. There are a lot of people who suffer excruciating pain simply because they have given up and don’t think any one can relieve it. And now I’m black and blue." No more sitting on a hard school bench. Coming out with back side sore. Kick old Harny down the stairs. Stick him in the washing tub." The use of corporal punishment to maintain discipline in schools and other communal environments has been a standard in human society for centuries. Today’s kinder gentler policies seem more humane, and in line with a permissive all forgiving tolerant society. From my perspective, and much though I abhor personal brutality on the Rugby field, locker room, in a public bar, on the streets or in the cell of a dean of discipline, I can not help wondering if without it we have grown a new community where the consequences for your own actions are not daunting enough, and that there is now no discouragement for unprincipled behavior. I think random acts of violence, destruction of public and private property, Graffiti, are the result of the anonymity that is now possible and the lack of appropriate punishment and the fear of it. From 1955 -58 I was sent to boarding school in Nairobi. 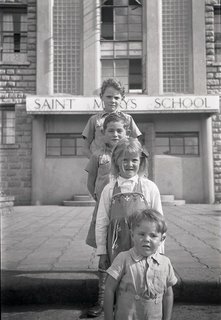 The School was called Saint Mary’s. 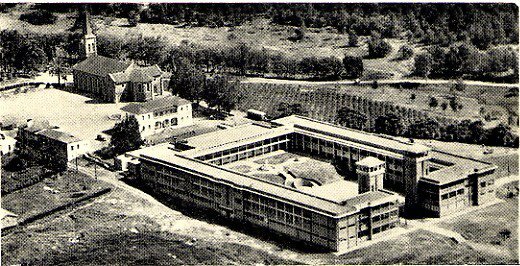 It was, and probably still is a Catholic School run by the Holy Ghost Fathers and was arguably one of the finest schools in Africa. I never really liked it, but knew that with my father gone, we all had to put on a brave face and get on with it. Mum was wonderful about taking us out on certain weekends. We loved those times together. The worst thing about being at school, apart from the bullying, was getting the cuts from Father Harnet. Just a sound caning with three or six of the best. While others had their eyes shut tight. On beneath your khaki shorts. On a cushion and we shuddered. Choking and humiliated we said “Thank you Father”. If you could sit without wincing. 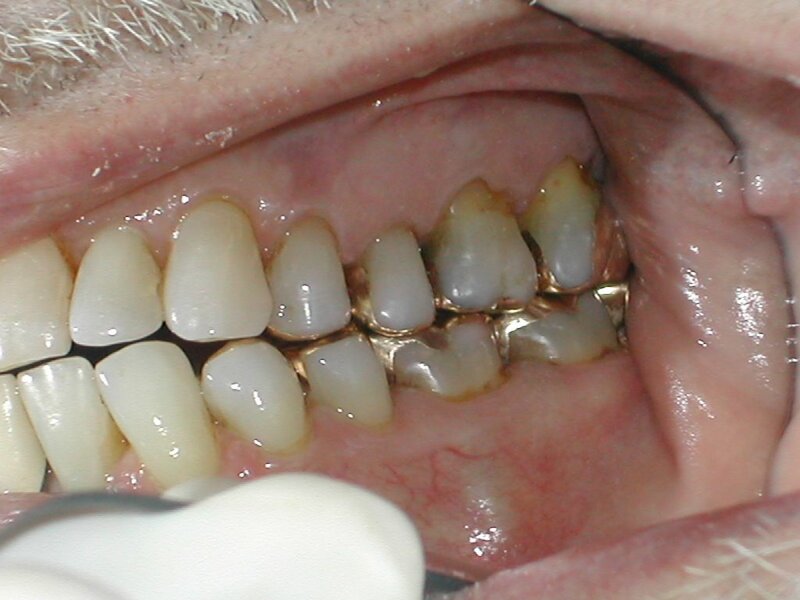 When it comes to restoring teeth there is no better longer lasting restorative material that the gold only or inlay. None, no matter how you argue the case, and many have. 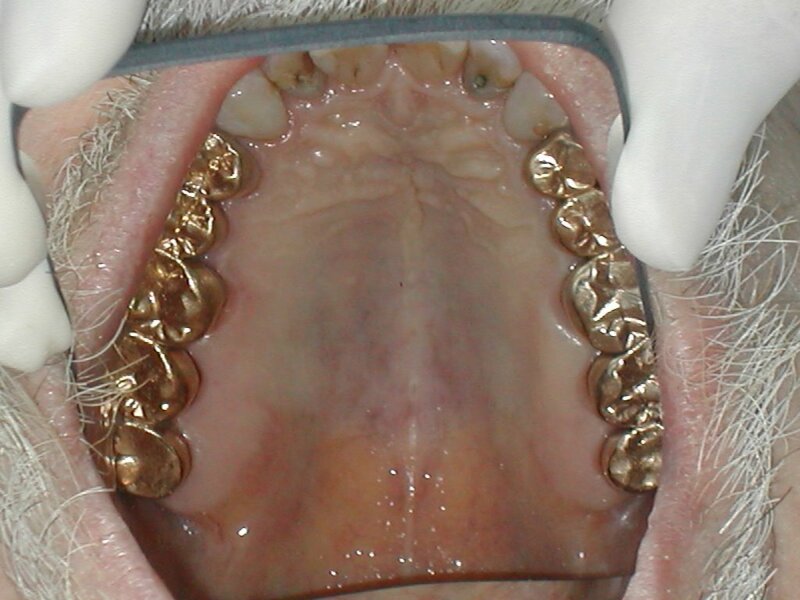 To start with, gold onlays have been placed in patients mouth for longer that any other material, and for the second nothing withstands the punishing demands made on the teeth over years of use. In my practice, one of the oldest in Los Angeles, where I am the third dentist (principal) to be running it, we have patients in their nineties who have onlays placed in the 1950's that are still functioning and look like they were placed last week. You can’t argue with success like that. The longest lasting porcelain crown can only have been in the patient’s mouth since the early 1970's, because Jenkins, of Newcastle University, only developed his technique for bonding aluminous porcelain to platinum in the late sixties. By experience we all know that the porcelain crazes and can cracks off anytime after seven to ten years. 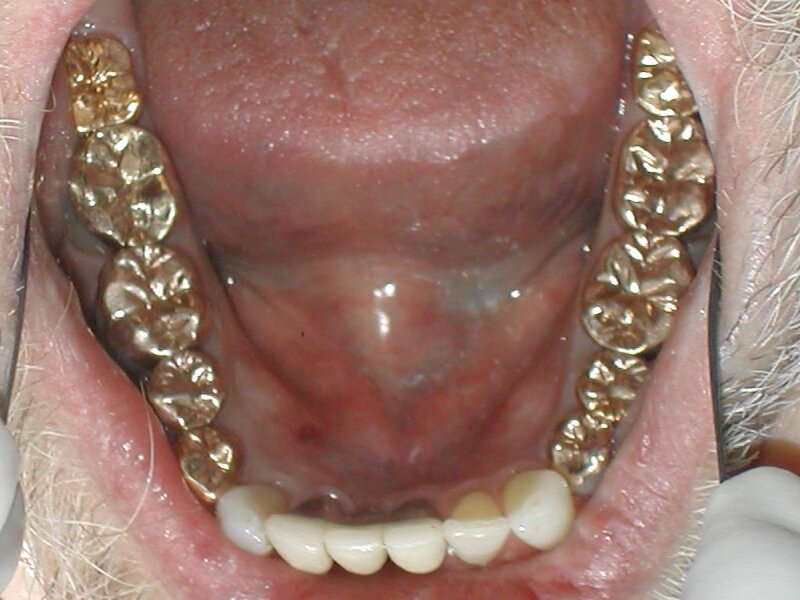 Not always, but often enough to convince me that gold is better that porcelain in areas where it does not show. 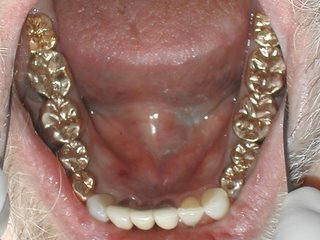 Now don’t get me wrong, I don’t want my patients having gold showing in their smiles, although if that is their wish, we can provide a parrot and patch to go with them. 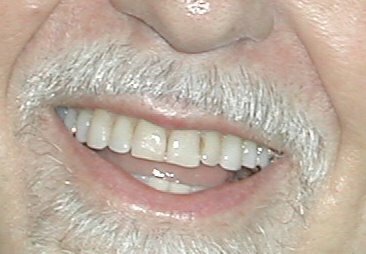 You have seen gold front teeth on some of our patients in the entertainment industry who wanted gold front teeth, but that was their particular preference. But take a look at this amiable smile and tell me if the gold in this mouth mars its appearance. You can't argue with work that has functioned well for thirty and forty years. 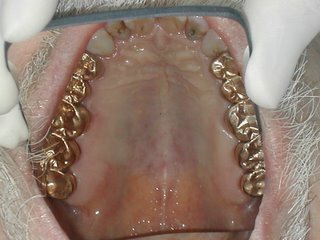 The fact is that silver/mercury amalgam, composite resin or porcelain and processed fillings don’t hold a candle to gold. Do you believe in the power of prayer? I do! I don't know how it works, but it has worked so often for me that I am convinced some one hears me when I pray. As I kneel down by my youngest son’s bed at night I have a great sense of contentment in the knowledge of this truth. I think our community and our country needs prayer, particularly now, when we are facing such critical challenges. The Senate is considering the Judge Alito nomination, and some of the most frightening political figures are aligning themselves against his confirmation. I want to exalt prayer and encourage you to do so, and I want to focus on two things, the Hollywood Prayer network which is headed up by my friend Karen Covell. So go ahead check that out. Inspired by Dr. Bruce H. Wilkinson’s book, “The Prayer of Jabez”, at a time when David Karkenny had asked me to give a short address to the graduating class of the Kids of the Kingdom Sunday School, at Hollywood Presbyterian Church. Will be straight, well marked and well paved. The treasures that God has in store. 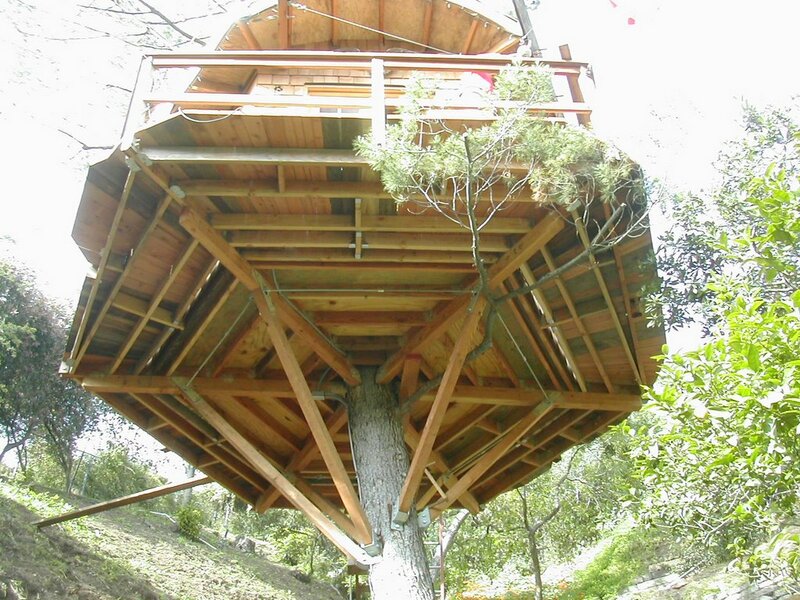 The sanctuary called "House of Sighs"
Is a sight that will tear-up our eyes. On earth, had we asked, which we'd missed. Through all of the pages until. Inscribed with their sorrow or fame. With little to set them apart. And caused him to write from the heart. Got more of what God had in store. Each request in the lines uttered there. May I from all evil be freed. Lord, guide me that I cause no pain." And that's why we remember his name. Why Jabez was held in such store. Lead us not in the pathways of sin." And offer your prayer up to God. Exactly the way God has planned. 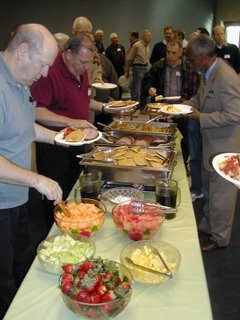 Getting men to come to a Men’s Breakfast at church is like extracting teeth, believe me I have done both. And yet the benefits are similar, the aching pain is removed by both services, from the tooth with the extraction, and from the conscience by attending the gathering. There is something wonderfully uplifting about praying together with a group of guys who all want to know God better, in their hearts they know they should be doing more, and the message at breakfast will last through Sunday and maybe all week helping us to be mindful of our walk and its purpose. On February 4th we are hosting our monthly Men’s Breakfast at 8.00 a.m. in the Mears Center at Hollywood Presbyterian Church, and our speaker is Mark Roberts. He is a truly inspiring teacher, an author, husband, father and Senior pastor at Irvine Presbyterian Church. 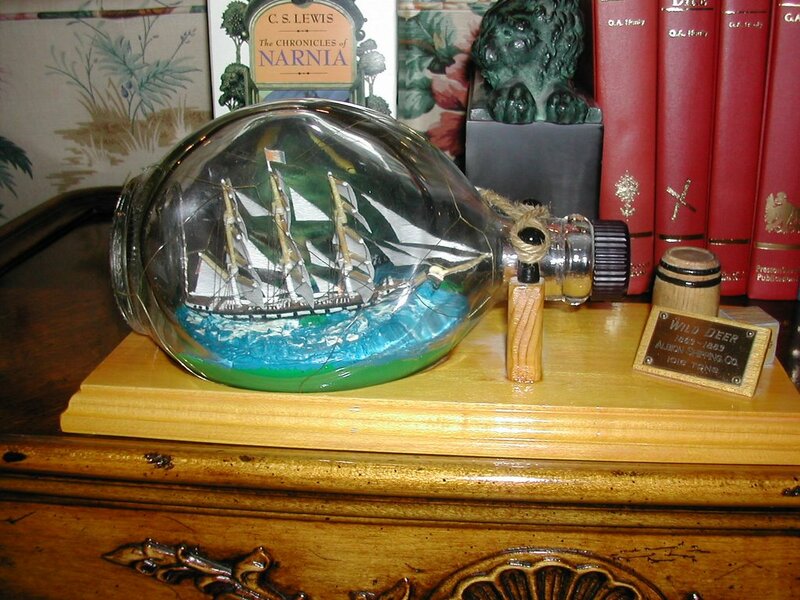 It took months to craft the model of the ship so that it was ready to put into a Dimple Haig bottle. All the sails have to lie down on one another and then be unfurled after they are placed inside. 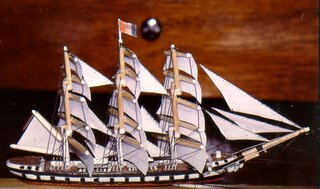 The 'Wild Deer' is the ship my great grand father sailed upon to New Zealand in1872. 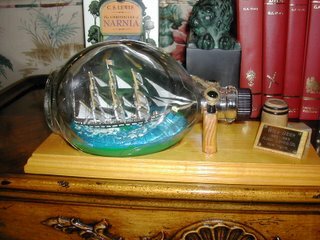 It took a hundred days at sea on the great circle route, and as steerage passegers they were sealed in the hold when the weather was rough. For racing home a hold of fragrant teas. Her rigging high above the plunging keel. To carry immigrants to foreign strands. Those emigrants who for new life prepare. By iceberg-flows in endless summer’s light. Of Port Chalmers in the south’s antipodes. The concert on the 15th of January was a truly memorable event, and Patrick Hare pulled the rabbit out of the hat again. Sorry I couldn’t resist. Professor Michael Brunner was an excellent Master of Ceremonies, with well researched and succinct comments on the participants. 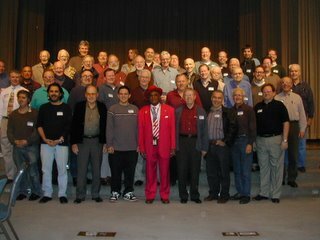 All the choirs were dazzling and The Hollywood Mass Choir just tore the place up, and we were ready. You had to be in a wheel chair if you weren’t standing and clapping and tapping. Andrea Kim Walker’s dramatic tribute to Rosa Parks has added a new dimension to the breadth of subject matter that might be considered suitable for a Martin Luther King celebration, and her performance of the scene on the bus when the arrest occurred was compelling. I got to play harmonica again as I went up to recite my poem “Oh Black and Unknown Bards”. I find it adds a little sparkle to the water. Now the real kicker. Tony Compolo's message that was brilliant. This is a man who knows how to work even the stiffest crowd, and he had a good message. I found myself softening my stance about leftist ideology. I found his arguments valid, that the analogy of what could be done in our society if we spent three trillion dollars on the poor and the needy and the underprivileged rather than war convincing. He mentioned gay rights once, and only glancingly, but still this was the wrong platform to do so. Personal sexual preferences have nothing whatever to do with a forum on civil rights. The extreme left constantly tries to equate the two and to blur our perception with a seductively juxtaposed argument. They want a morality-blind and color-blind society. Well I don't. Saying part of the truth is just as good as saying a complete lie. But I am convinced that this preacher/speaker/author is one of the best on the circuit, and found myself wanting to buy one of the books that he was signing after the concert. That I resisted. I thought of my bonny bride at home, and our three children, and I knew that for the moment the money would be better spent on them. One final thought. The Martin Luther King holiday has been a minor American holiday, one upon which many still work. Personally, I have always have been confused between celebrating human rights, and justifying public handouts. I do believe now that there is more to the holiday than that. It now seems the be the focus of the next area of growth in our democratic experiment, and I and America are growing. 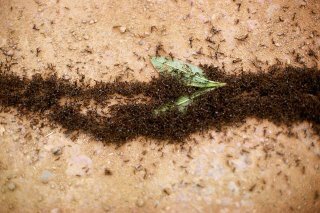 As a boy I thought a day had been usefully employed if I could boast a ring of Siafu ant heads around the hem line of my khaki shorts. 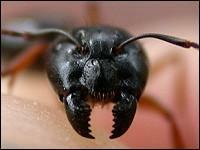 We would catch a large soldier ant and hold him so that his pinchers could grasp the bottom of the cloth. Then as soon as he had bitten we would nip off his body leaving the head permanently attached. I have been told that it is perfectly possible to align the edges of a severe skin wound using siafu heads as sutures. 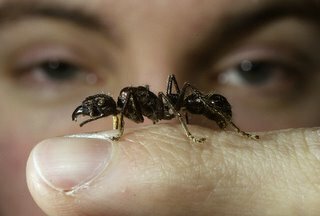 These migratory fire ants will pass through an area and eat every living thing in their pathway. With big soldier ants that keep guard at the side. There won’t be much left of you at all. Not a living thing’s left, the whole place is clean. Only the crop’s left when they end their trail. Then all bite together as if by intention. In a day and a half their bones are picked clean. They invade but are gone in a day or two. It took eleven months, working weekend and nights, and everyone in the family has helped. 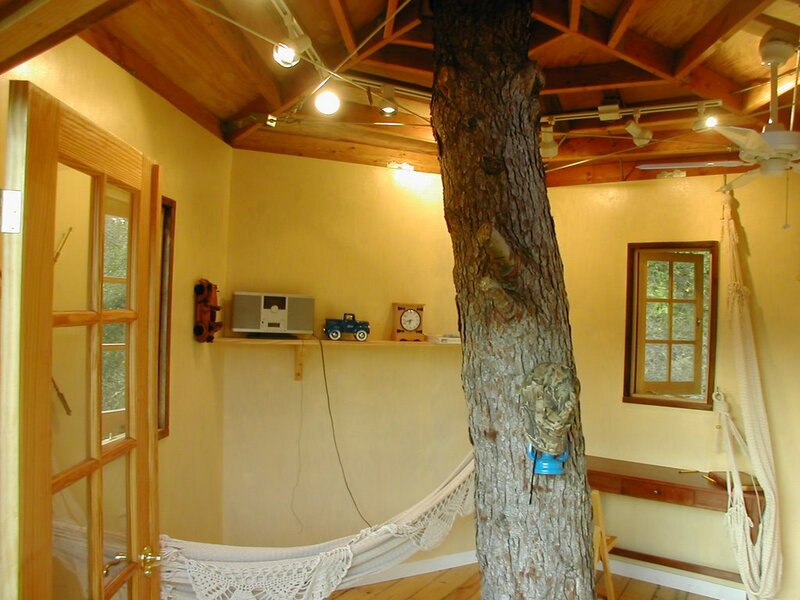 Now all of us just love to spend time looking at the view, learning a poem or writing, or just lying in the hammock. Any one in sales and marketing, anyone with a product or service they want move, anyone who wants or need to make money should know about networking. It’s the big 'N' word. Let’s talk networking, you know, the standing around balancing a drink and chatting to people trying to maneuver the conversation in the direction of “let me have your card” at which point you will promptly present them with yours. Then after the obligatory three to five seconds of appreciative glancing at it, the card is stowed away in the left side pocket to be conned and analyzed later as the information is stored in your data bank. Does this ring a bell? What about the endless cards at various festivals that say thinking of you, I just wanted to stick advertising promotional specialty under your nose so that you might think of us if you or some one you know needs our service. 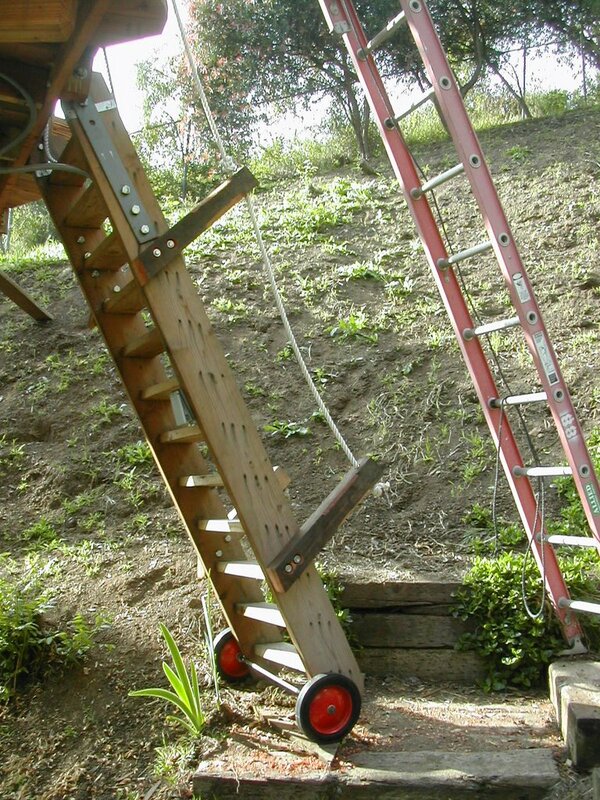 There is a better way. 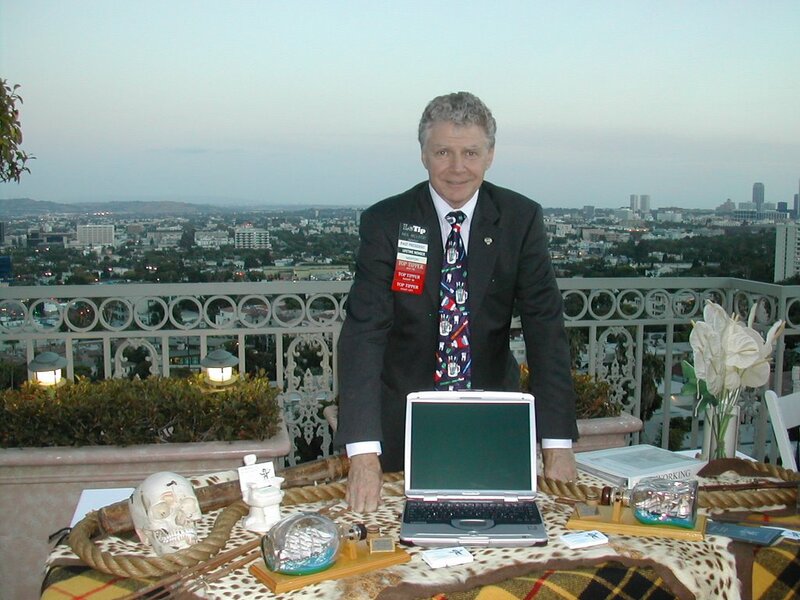 There is an American way that really works, and you will find it in the networking clubs. I found it in LeTip. Go on say it again LeTip, I’m sorry if it sounds French. At these weekly club meetings everybody gets everyone else’s card and what is more you get a chance to stand up, while no one interrupts you, and say exactly what you do one time so you don’t have to repeat yourself over and over again. 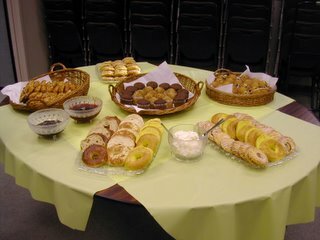 To stay in a LeTip club you have to give business leads to other members of the club, and your performance is measured. I know it sounds crazy, but let me tell you that in my club, the Executive LeTip of West Los Angeles, which has about ninety members, we produced over three and a half million dollars in business last year, generated amongst ourselves. Now you do the maths say there are a hundred of us, divided equally that is $35,000 each. Would you turn your nose up at and extra 35G’s, not me. Read the Time Magazine, Los Angeles Times and the New York Times articles and you will see that this phenomenon is getting the attention of top business analysts. Fortune Magazine made quite a point of it. The bottom line, is do what works best for you. Personally I can not see the point of spending time and socializing with people who are not sufficiently interested in what I do, to find out about the quality of dental care that I provide to my patients. Life is too short to spend with people who do not support your business, the trick is to find people you like in various professions and cultivate the referral base. That is the opportunity LeTip gives us. 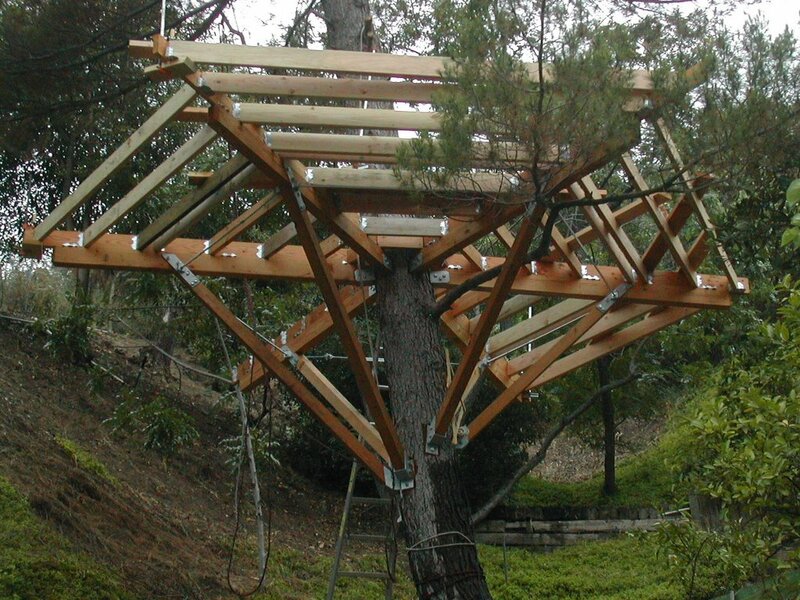 A great concept started by Ken Peterson in San Diego, and now going world wide. Get on the band wagon check out LeTip and see why I made my choice and why I am so pleased with it. When we moved from Kericho to Kitali, about 1953, the Mau Mau emergency was underway and we always had an armed guard, usually a Kipsigis Warrior, to protect our home while we slept. 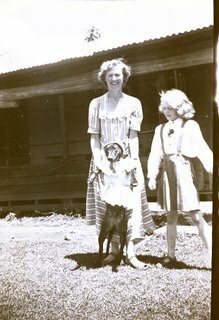 When great aunt Kitty came out to join us in the colony, she would sit rifle on her lap for many a night, then retiring late have tea at eight in the morning. Then came our noble Kipsigis with bow and arrows on. His semi and his arrows while he had his cup of tea. We’d close the house and spray the eves but he’d not say a thing. Guarding us against some Mau Mau villains on the roam. Something that un-noticed could mean he and we might die. And even if you looked for him he never could be found. You woke and wondered if your “Kip” had gone and broken camp. And having made the tea you’d take a cuppa to the door. Thanking God you’d made it safely to another day. To take his ‘kongui mising’ our Kipsigis arose. Chamge - Hail, Hello, a Greeting - with an extended sing song delivery on the last sylable. Kipsigis - A large tribe of Kalenjin speaking people who live in the Nandi Hills near the Kericho district of the Rift Valley province in Kenya. The language is shared with the Nandi, Keiyo Turkana and Cherangany tribes. Kongui Mising - Thank you. I asked my father one day when he was visiting me at my old home in Laurel Canyon, “Do you remember the first time I ever saw a dead body?” We were sitting in the hot tub underneath the eucalyptus trees. “Was it at Guy’s?” he replied casually. This was the obvious answer, for I had spent a number of years there studying dentistry at the medical school. It was on our minds as he had just given me an engraving of the Royal Albert Hall where he had watched me receive my degree from the Queen Mum. She was the Chancellor of London University. The graduation ceremony seemed a long time ago now, and I was ensconced on the hill with a practice on Sunset Boulevard. The present had brought it all back, it showed the Albert Memorial at the Knightsbridge side of Hyde Park, and the concert hall with its wide flattened dome and red brick facade across the road. I loved the hall. We would go there, ‘to dress the theater’ as students. Free tickets were made available on the day of performance, and could be obtained from the college porter at The East Wing at Guy’s Hospital. Once I went to hear the first concert after the new circular fiberglass dishes were suspended from the dome ceiling to improve the acoustics. It was an amazing program that included Bruckner’s sixth symphony which commemorated Wagner’s death, and has beautiful soft string passages and brash brassy highlights in the Wagnerian style, and also the 1812 Overture with cannon at the end. “Good God! Do you remember that?” he queried, leaning in from the side of the tub. He was more intent now than I had seen him appear in many a year, yet he had that rye knowing smile that said there’s a lot more to tell. “Go on.” he said looking directly at me now. The level of casualness had vanished and I felt scrutinized, glad that only my head and neck were out of the water. The recorded African jungle sounds were coming from the two speakers on the low dias, with potted geraniums at their sides. The controls for the bubbles and the heat were there at a touch of a button. “Do you remember that time we were driving up the escarpment, I think it was in your new blue Chevy truck. You were giving two Askaris a lift. 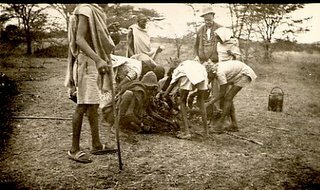 We had passed the little church build by the Italian prisoners of war, and we suddenly stopped to let them take care of that body that had been run over.” The road up from the Rift Valley was steep, with lots of bends and sharp turns. It lead up to the Kenya highlands, the plateau dominated by Mount Kenya at whose feet the Aberdere forests spread out and were watered but the mists, and where to the south, the capital, Nairobi ,was nestled on the some-times river at the foot of the Ngong Hills. The Askaris were the native police. They wore dark blue Fez hats with the silver Kings African Rifles crest, a matching blue jersey with leather shoulder pads, a white lanyard with a whistle on the end, and khaki shorts and navy putties. Their feet were bare. “What kind of work were you doing, Dad.” I asked, confused by this revelation which jarred with my notion that my father’s occupation was as a Labour Officer, working with the local District Commissioner, a man named Mason. I did know, and I was horrified. A flood of memories came rushing back. The awful slaughter on the farms, and tragic return home of the farmers to find their hard work decimated by this terrorist madness. The abduction of Robin Touie, whose lacerated and fly blown remains were found rotting under a bush not far from the Spread Eagle Hotel. He had just gone out on his birthday to try out his new air rifle, and was never seen alive again. Oh yes! And Aunt Kitty sitting up late at night with the lamp out, and a rifle across her lap, waiting for a break in the song of the crickets, the warning sign of the approach of an intruder. The rest of that evening is a blur to me now. 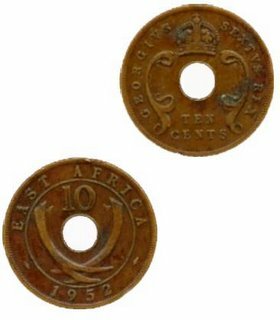 I know we talked for a long time, but not much more was said about Africa, and dad always seemed reticent to dwell on any of his wartime or Kenyan experiences. In a way I suppose they were all part of the same collection of memories which for him were better not discussed. They were “Government work”. By the time I retired that night, the moon had crossed the sky and though hidden behind the cloud which surrounded us then, its light fell on the comforter of the waterbed. Caroline Elkin’s book “Imperial Reckoning: The Untold Story of Britain's Gulag in Kenya ” which I have read has provided me with the answers my father never gave me. In grim detail the appalling nature of the Mau Mau uprising and the drastic measures taken by the British Government to crush it are spelt out. A million people were incarcerated during the 1950's. I remember we were terrified of the ‘oath takers’. We felt that they would come and murder us all in our beds. That is why we had armed guards protecting our home every night. Our fear dehumanized our enemies, and in our minds nothing was too bad to cure them, to make them admit their status and recant their oaths. When you feel that an individual has information the possession of which will prevent others from being hurt, harmed, killed, and they insist on concealing it, it is a natural instinct to exert what ever pressure you can to extort it. 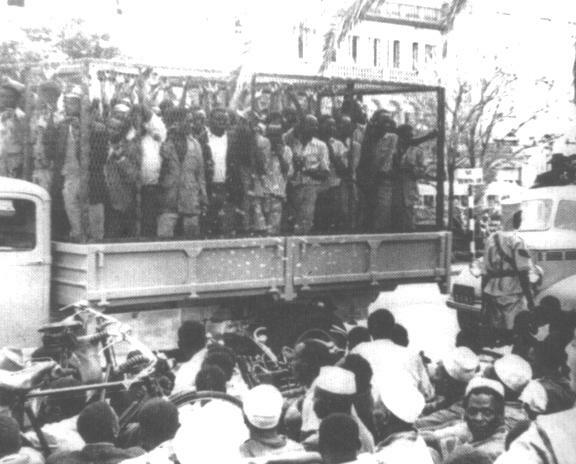 This had lead to cruel and barbarous treatment of prisoners, and wrong though we think it is, in the clear light of our land of the free, it was handed out by the British in Kenya, the Japanese in southeast Asia, and I strongly suspect that it is being carried out today by the American Government where necessary. War is not, never is, pretty, and the exposed underbelly of the victors in any conflict can not be expected to be all roses on close examination. Britain's attitude was that it had never happened. Understand me, I am not defending what my father was doing in Kenya. Quite the contrary, I am saddened. The fact that he never talked about his war in Malaya and North Borneo, or his activities as a Labour Officer in British East Africa is witness enough to the fact that he was not proud of his actions. I just think there is a self righteous liberal seam running through western culture that fails to recognize that moving forwards traditionally means moving your opponents out in toto. Forgive them or re-intergrate them and you leave yourself permanently exposed to conflict and insurrection. The fact is that when someone needs something you have got, and they want it badly enough, they will go on hurting you, humiliating you, emasculating you, torturing you until you deliver or die from the cruelty. This is an aspect of war which we are refusing to accept, and will not condone in our own military, and it is a lie to say that it does not happen. 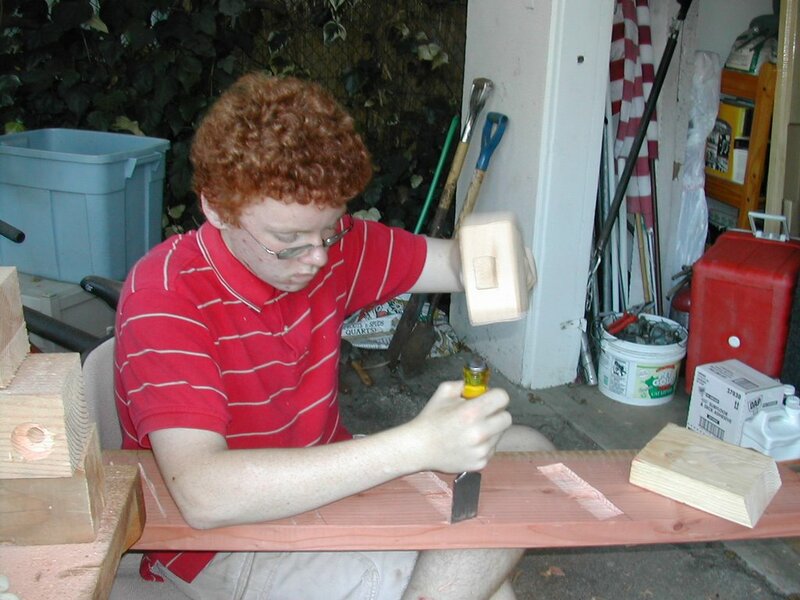 I can’t tell for sure when thespian tendencies surfaced and became an influencing factor in my life. 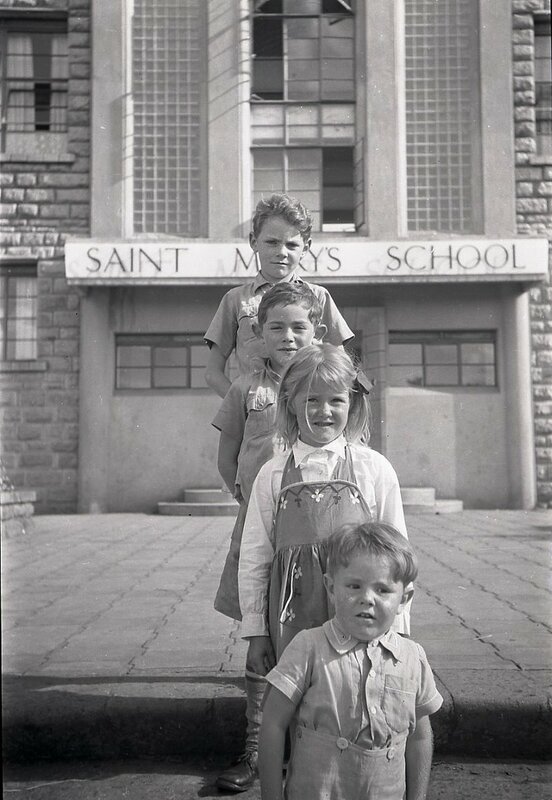 I don’t think it was as early as the time when, at five years old, I failed to follow Mary, the one with the lamb, and make my grand entrance late as Old King Cole. My green tunic was raised, and in front of the entire rehearsal team I was roundly smacked, and me with no under ware. No it wasn’t then. But may be later in Oxford, when I strode the boards with the CODS, the City of Oxford Dramatic Society, and in the part of a young knight, took “All’s Well That Ends Well” in my stride. Yes, then it was that the ever glancing eye strained out for the proscenium, any proscenium. Now I write and perform poetry with the least provocation, and welcome invitations. 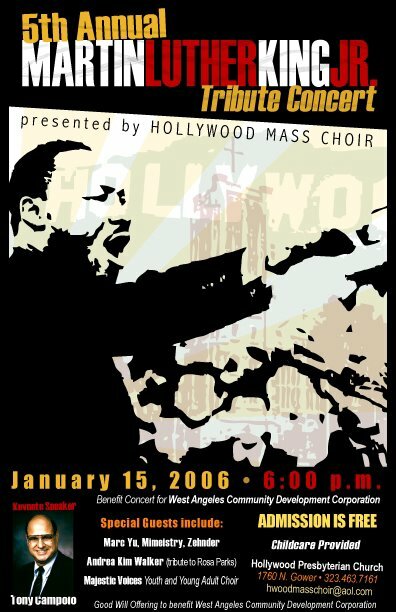 So it was that when Patrick Hare asked me to perform again for the Martin Luther King Concert I said yes. I did not ask with whom I would be sharing the stage. I just assumed that as a church endorsed event it will be above board and in good taste. 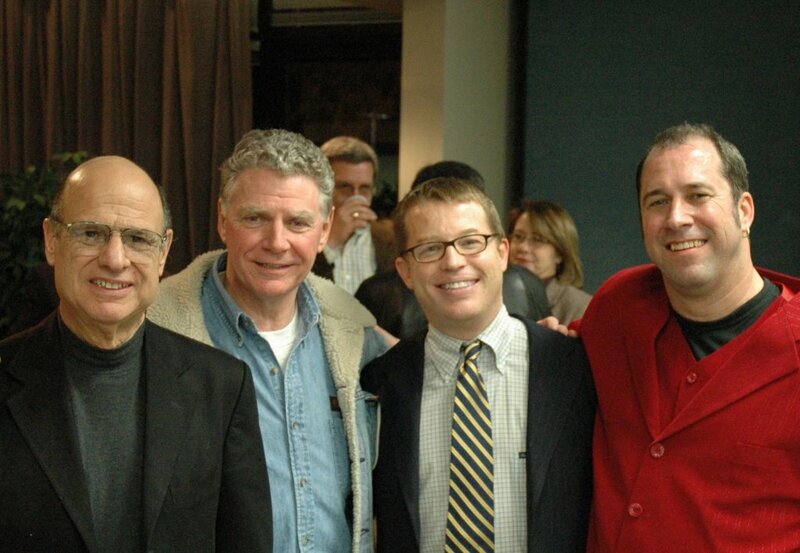 Once the advertising fliers came out I saw that Tony Campolo is to be a key note speaker. 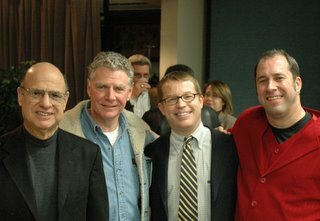 I also noticed that there is a distancing of any complicit support the church might have for this event on church property because of the inclusion of this caveat “The views expressed in this program do not necessarily reflect the views of Hollywood Presbyterian Church, its staff or its members”. I asked myself why they would feel the need to state that. They never published that when I was to read from Luke on Christmas eve. No, something was different. It was the controversial nature of our key note speaker and his support or lack of condemnation for the non biblical interpretation of the gay agenda which has characterized his public appearances. So I find myself in a state of internal conflict. 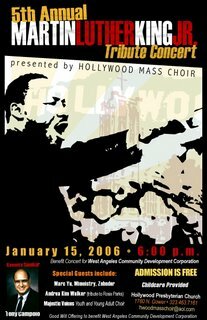 I agreed to support my friend Patrick Hare and the Hollywood Mass Choir, and yet I am anxious that none of the liberal agenda contaminate our celebration of the work and life of Martin Luther King in aiding the emancipation process in our great country. The two are entirely separate agenda. My piece this year is James Weldon Johnson’s “Oh Black And Unknown Bards”. I will be performing it this Sunday 15th January. The hyperlink can lead you to an audio recording. January, Wed 25th , Thu 26th. Here we go, one month after Jesus’ birthday Scots worldwide celebrate their national bard, Robert Burns. The corporal details of this much loved poet are drummed out once more, and favorites like “To A Mouse” and “To A Louse” and of course “Tam O’ Shanter” will delight audiences and diners alike. More than enough "horizontal lubricant" will be consumed in stark contrast to the reserved polite Christmas revelry, and undoubtedly there will be ample opportunity for those who neither care nor know better to degrade themselves in public and private. January 25th is Robert Burns birthday, and he is well remembered. Not least among the literary treasures that are trotted out is the “Address To A Haggis”. It celebrates a humble dish made of left overs and oats, spiced to taste. It has become traditional, and nothing thrills the Scots more, to invoke pangs of squeamishness in the lily-livered hearts of their neighbors to the south by exhorting in grim detail the fanciful contents of this large round sausage. So much is this so, that a mythology has arisen concerning the origin and nature of the beast called Haggis. 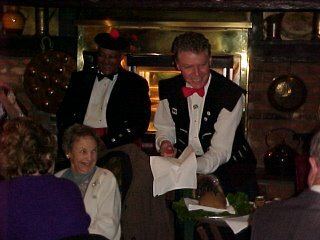 It is with little reservation that I admit to you now that I shall be slaying the haggis again, first at the Mayflower Club, Eileen Selby’s British flagship on January 14th and then at the Tam O’ Shanter Restaurant on January 25th and 26th. My special dirk, I call it “Haggis Slayer” has been used for this one purpose for close to thirty years, and considering that it has sliced open haggis between twelve and sixteen times each year, I would hazzard a guess that it may have been used over four hundred times. I am sure that is some kind of record. Would any body like to correct me? 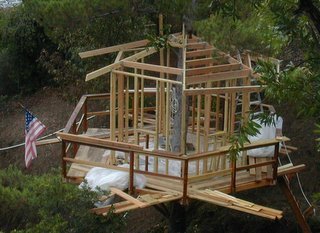 We lived on a bungalow in Koru in western Kenya in 1951, and the ceiling of the dining room was made of the plywood sides of tea chests. Across three of them the outline of the snake could be seen where it had died in the roof. Around two walls of the room was a python skin it must have been over twenty feet long. One morning I woke early to see what I thought was the hooded head of a cobra. As the morning light grew, I could more clearly see where the dogs may have torn the fly screen. The picture is of my mother, Frances, and my sister Flora, and Judy our dog that they have dressed up for the occasion. In the background you can see the Snake House. I called it the snake house. Others may not have done. And pigeons cooed when the light was soft. 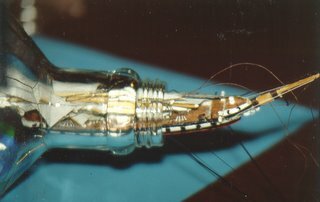 Showing where coiled one lay. I mistook it for a flared cobra’s hood. 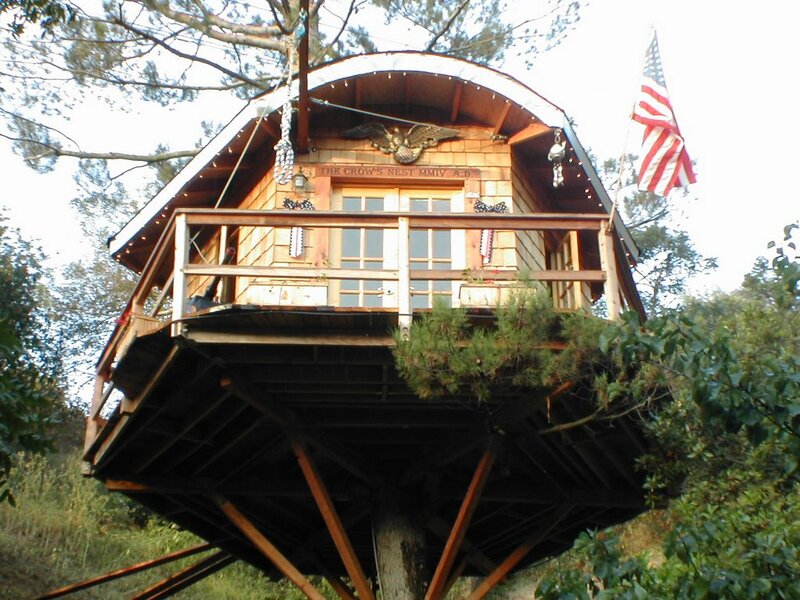 So I called it the snake house! 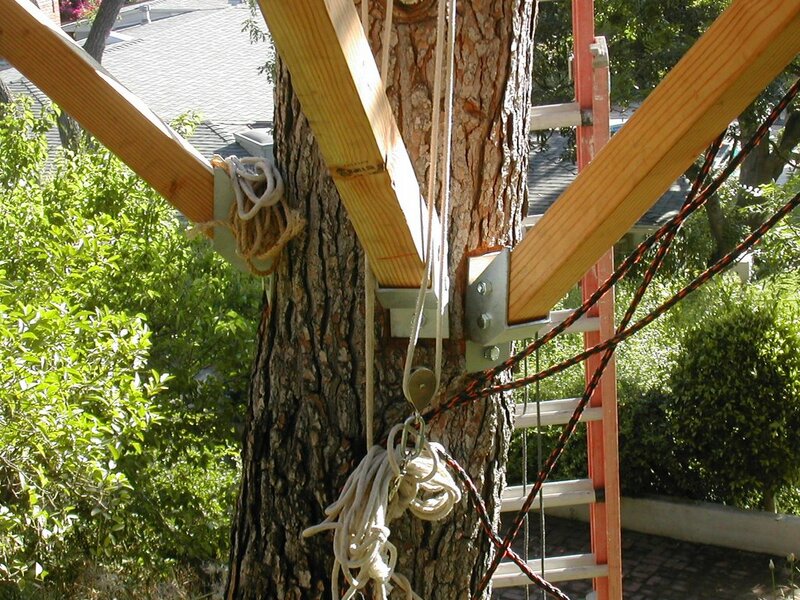 The problem with a circular tree house is obtaining the brackets to support it. 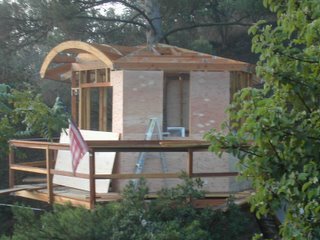 I found nothing standard that would suffice, so drawing my own plans I had a friend who is a really fine construction contractor, Cliff Muller, and he took my drawings and had the brackets made up for me. My son Roddy cut the mortises for the steps of the ladder up to the deck. It seems we are not alone in our passion, for Smithsonian Magazine, the Los Angeles Times and many books have been written about tree houses. 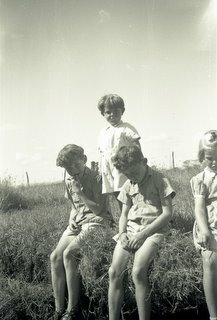 I lost my first tooth in Kenya, when I was six in 1953. My dental assistant Sandy told me that she had forgotten to put coins under the pillow for her son Erik, and had given him $5 to make up for former missed visits by the tooth fairy when he last lost a tooth. and the visit from the tooth fairy. let the moment slide away. And fall all the way down below. Or fall all the way down below. To guard lest I fell down below. 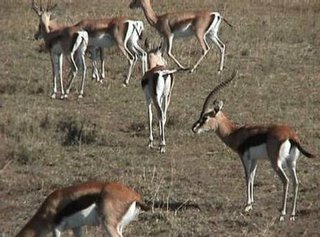 In the early 1950's we lived up country in Kenya and my father provided us with meat from the game on the plains outside Kericho. We had no refrigeration, just a fly proof meat safe with double screen doors. A Thompson’s Gazelle could provide us and our staff with food for a week. 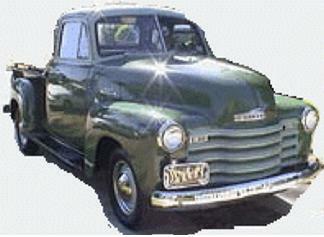 I shot my first buck from the back of a green Ford pick up truck in 1952. Leaping this way and that. With mushrooms, after the rain. And the African night is falling. To the prey when your only four. And, never again shall I! As a boy I was raised in Kenya, and our first home was way up country in a place called Koru. 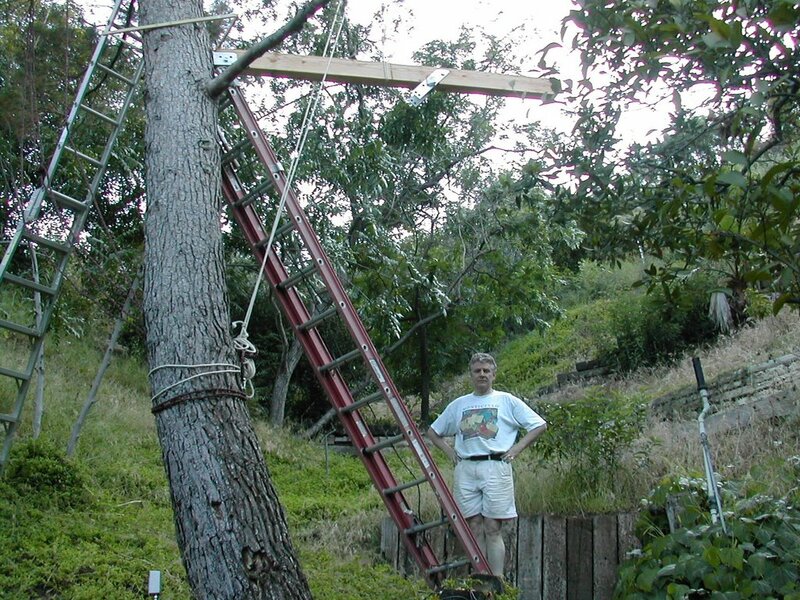 My father’s work took him away from home on extended hunting trips. During one of these absences my mother had a bout of malaria, and we went to stay at a mission station run by the Röetikinen sisters. I believe they were Lutheran missionaries. At mid-day when the day was hottest, they always rested, and they wanted us children to stay in our room and be still. They confined us there by taking away our shoes. While the missionaries rested their eyes. Their station became our home. To keep me out of the sun. And the grasshoppers jumping to hide. These are the sounds that merge. From my early Kenyan days. Which hissed as they gave us light. Sprayed round the eves at night. Would burn if ever I strove. From there I took in the view. Africa sizzling in my mind.